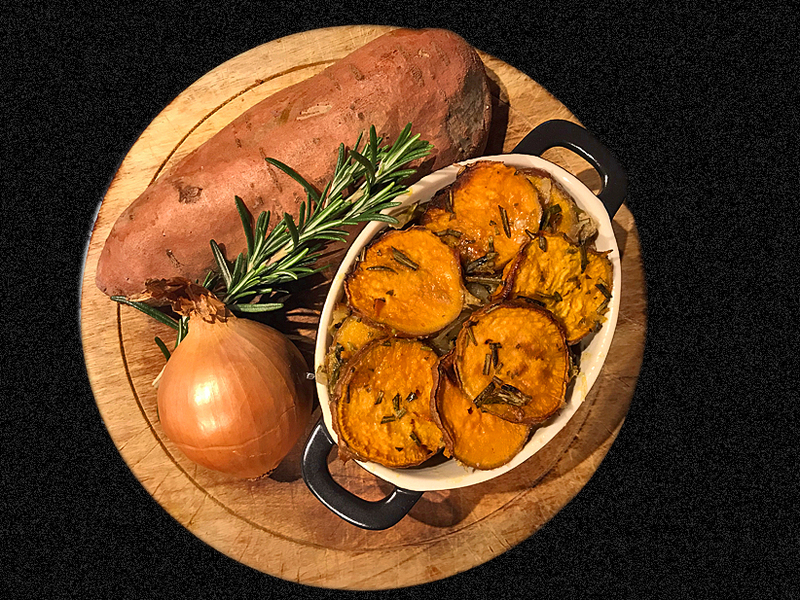 I just couldn’t resist picking up a bag of beautiful fresh sweet potatoes from the farm shop, On getting home I had the idea of some comforting potatoes boulangère, so named because in France they were given to the local baker to place in a bread oven to cook. With no luck searching for a suitable recipe I decided to adapt Delia’s recipe to incorporate sweep potatoes. The results were spectacular! In an ovenproof dish: Arrange a layer of potatoes, then onions, followed by a scattering of rosemary, salt and a grind of pepper. Continue layering in this way, alternating the potatoes and onions and finishing with a layer of potatoes that slightly overlap. Now mix the stock and milk together and pour it over the potatoes. Season the top layer and scatter over the whole rosemary leaves. Now cut flecks of the butter all over the potatoes, and place the dish on a high shelf of the oven at 180°C for 50-60 minutes, until the top is crisp and golden and the underneath is creamy and tender. These can be made in advance and easily re-heated… Enjoy!